The Lab has been working closely with lecturer Laura Dunham from the University of Canterbury’s Art History and Theory Department to create a website using the web publishing platform Omeka. The site houses a sub-collection of digital facsimiles of Samuel Hurst Seager WW1 memorial lantern slides. Laura received just over $21,000 from the NZ Lottery Grant Board to undertake the digitisation and publication of this precious lantern slide collection. 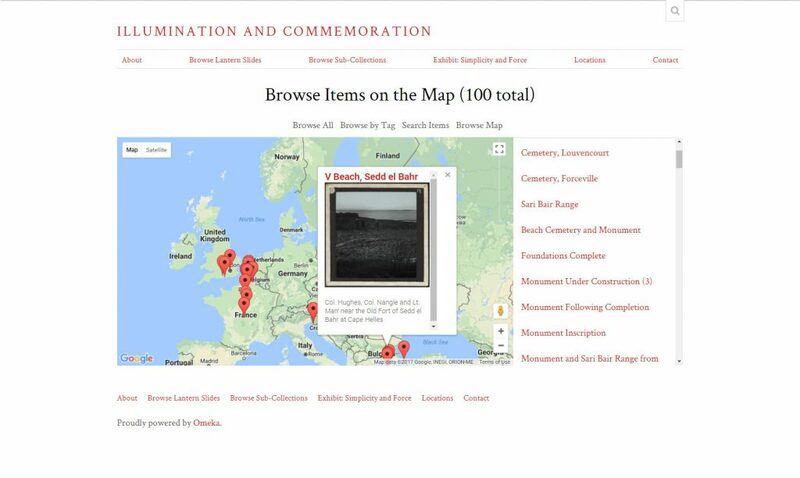 The site features geo-tagged digital images of the lantern slides, allowing users to get a sense of the spatial context of the memorials. The website is a part of the University of Canterbury Art History and Theory Department’s contribution to the WW1 centenary (WW100). The website is expected to be launched in 2018.